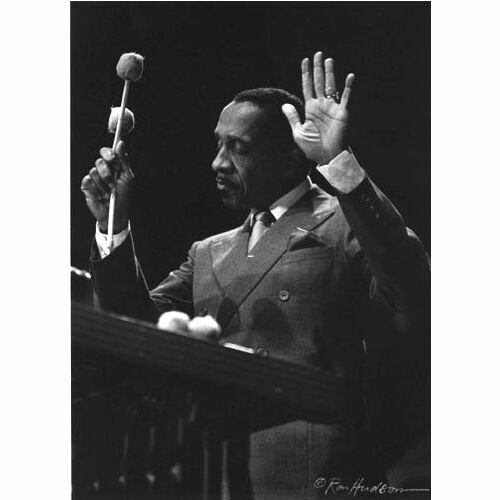 Milton "Bags" Jackson (January 1, 1923 - October 9, 1999) was an American jazz vibraphonist, usually thought of as a bebop player, although he performed in several jazz idioms. He is especially remembered for his cool swinging solos as a member of the Modern Jazz Quartet and his penchant for collaborating with several hard bop and post-bop players. A very expressive player, Jackson differentiated himself from other vibraphonists in his attention to variations on harmonics and rhythm. He was particularly fond of the twelve-bar blues at slow tempos. He preferred to set the vibraphone's oscillator to a low 3.3 revolutions per second (as opposed to Lionel Hampton's speed of 10 revolutions per second) for a more subtle vibrato. On occasion, Jackson would also sing and play piano professionally. Biography edit: He was discovered by Dizzy Gillespie, who hired him for his sextet in 1946 and also kept him for larger ensembles. He quickly acquired experience working with the most important figures in jazz of the era, including Woody Herman, Howard McGhee, Thelonious Monk, and Charlie Parker. In the Gillespie big band, Jackson fell into a pattern that led to the founding of the Modern Jazz Quartet: Gillespie maintained a former swing tradition of a small group within a big band, and his included Jackson, pianist John Lewis, bassist Ray Brown, and drummer Kenny Clarke (considered a pioneer of the ride cymbal timekeeping that became the signature for bop and most jazz to follow) while the brass and reeds took breaks. When they decided to become a working group in their own right, around 1950, the foursome was known at first as the Milt Jackson Quartet, becoming the Modern Jazz Quartet in 1952. By that time Percy Heath had replaced Ray Brown. Known at first for featuring Jackson's blues-heavy improvisations almost exclusively, in time the group came to split the difference between these and Lewis's more ambitious musical ideas (Lewis had become the group's musical director by 1955, the year Clarke departed in favour of Connie Kay), boiling the quartet down to a chamber jazz style that highlighted the lyrical tension between Lewis's mannered, but roomy, compositions and Jackson's unapologetic swing. The MJQ had a long independent career of some twenty years until disbanding in 1974, when Jackson split with Lewis, partly in an attempt to make more money on his own and, more likely, because he sought the improvisational freedom he once enjoyed. The group reformed in 1981, however, and continued until 1993, after which Jackson toured alone, performing in various small combos, although agreeing to periodic MJQ reunions. From the mid-1970s to the mid-1980s, Jackson recorded for Norman Granz's Pablo Records, including Jackson, Johnson, Brown & Company (1983), featuring Jackson with J. J. Johnson on trombone, Ray Brown on bass, backed by Tom Ranier on piano, guitarist John Collins, and drummer Roy McCurdy. He also was a guest on recordings by many leading jazz, blues, and soul artists, such as B.B. King, John Coltrane, Wes Montgomery, and Ray Charles. His composition "Bags' Groove" is a jazz standard ("Bags" was a nickname given to him by a bass player in Detroit. "Bags" referred to the bags under his eyes from his habit of staying up all night.) He was featured on the NPR radio program Jazz Profiles. Some of his other signature compositions include "The Late, Late Blues" (for his album with Coltrane, Bags & Trane), "Bluesology" (a Modern Jazz Quartet staple), and "Bags & Trane." Milt Jackson was a resident of Teaneck, New Jersey. He died on October 9, 1999, aged 76, and was interred at Woodlawn Cemetery, Bronx, New York.